ICON Shock Wraps are a must have for vehicles that see Extreme Weather Conditions or Dirty / Muddy Off-Roading more often then not. These neoprene coil over shock protection covers offer an added layer of resistance keeping dirt, mud, grime, snow, harsh road salts / spray's, and rocks from getting to the shock shafts or seals. This added layer of protection helps prevent damage like shaft pitting & cut seals that require you to have your shocks rebuilt prematurely. ICON Shock Wraps velcro on in seconds, and have a nice form fit with elastic banded ends to give you the most protection possible. 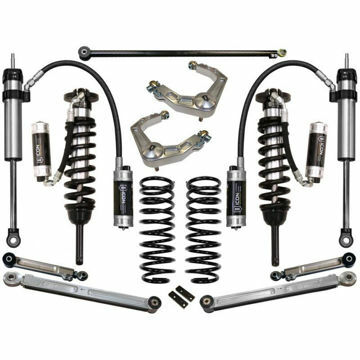 The Stage 7 suspension system for the 2007-2009 Toyota FJ Cruiser is the best over all handling bolt on suspension system you can install, and incorporates all of the top level components along with adding the CDCV adjustable shocks.